« NAPICS: Pizza and Ice Cream and Freebies…Oh My! Pizza Grand Prix III, March 7th 6pm – 8pm, Admission is FREE! When I was growing up in Columbus every March there was an event a the fairgrounds called Extravaganza. The commerial always ended with a cheesy announcer voice shrieking “ADMISSION IS FREE”. Well – admission is free to PGP but the only cheese we offer is on the pizza. 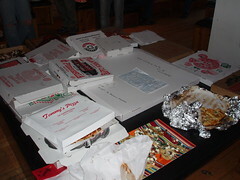 And for a taste of past Pizza Grand Prix events – see below. Come out and join us. When you know you are coming – post here or on Columbus Underground so we can track a rough headcount. We will have a few freebies, a lot of pizza, drinks are BYOB and this time we will have voting in place to so everyone can support their favorites of the night. Here is the drill – we expect to have twenty plus types of pizza – the volume depends on how many people show up and what time people walk through the door. We have napkins, plates, red pepper flakes, parmesan cheese and a pizza cutter. Sample to your hearts content and perhaps your stomachs regret. All are welcome to bring tupperware to take some pizza to go when we wind things down after 8 PM. There will be a prize for the best homemade pizza as determined by voting. We do ask that you ask to have your pizza cut in squares – aka – tavern cut – this helps with the process of pizza sharing. If you are bringing a pizza from your favorite pizza place – bring some extra menus with you – so other people can support your favorite dough slinger in the future. If you are stumped on where to get a pizza from (could this be?) check out my slice of CMH link at the top of the blog. 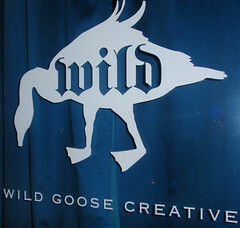 Hope to see you there – PGP has been one of the favorite Columbus Underground events and Wild Goose Creative is a wonderful place to host a community event. BE THERE, BE THERE, BE THERE! Note: More info to come during the week – I have been hampered by haphazard wireless connection crowded coffee shop internet access so posts have been delayed and rushed. This entry was posted on February 28, 2009 at 1:50 PM	and is filed under Clintonville, Columbus style pizza, events, kid friendly dining, pizza. Tagged: Pizza Gran Prix. You can follow any responses to this entry through the RSS 2.0 feed. You can leave a response, or trackback from your own site.